Los Angeles is certainly fun, I recall a certain I visited there and thanks to you Arlee had a great time.....thanks. My choice for BOTB is Jenny and the Mexicats. most enjoyable. Yvonne, you saw some of those sights in Jenny's video when we went to Hollywood so I'm sure you could appreciate that. Dressed in a reindeer suit was just a little too odd for me. Not crazy about the song either. Jenny and the Mexicats get my vote and bonus points for having a VW Bus that actually still runs. Alex, a reindeer sort might be kind of tame for some parts of L.A. I recommend visiting the Getty Museum in L.A. Pop Tart, I've been to the Getty many times and it's well worth a visit. Great art and fantastic views. Interesting battle, Lee! ☺ I have to be honest, the second one with its repetition and monotonous beat didn't do much for me. The kids were cute in their costumes, though. Jenny and the Mexicats were good and the video was more interesting as well. Please give my vote to them. One of our most famous tourist attractions is a 45 minute drive away - Niagara Falls. We go there often. Last visit was this past weekend. Their annual Winter Festival of Lights is spectacular! Wishing you and your family a Merry Christmas. Debbie, like much electronic dance music, "I Love It" is indeed repetitious. I started finding it to be rather compelling and addictive and thus began to like it. Niagara Falls is a must see. I've been there many times and would go back anytime if I could. I'd love to see that Festival of Lights. Two new-to-me artists. This was an easy pick for me. I'm giving my vote to Jenny & the Mexicats. Verde Mas Alla was fun and made me want to dance. Need I say more? :D Have an awesome weekend, my friend! Cathy, you said it well. A vote for the Mexicats. Lyrically, I preferred Jenny and the Mexicats, though the Postino video was fun. The Albany area has a lot of historic monuments and houses, though many of them are unfortunately downtown, where it's hard to find parking or even navigate the streets by car. Downtown Albany isn't nearly the type of area it used to be a few centuries ago, or even 50 years ago. One would never guess it used to be full of mansions and was full of very well-cultivated neighborhoods. A bit further afoot, there are preserved battlefields and more famous houses in the Saratoga area. There are also things such as Erie Canal locks, Cohoes Falls, and all the memorials and monuments around the Empire State Plaza. Carrie-Anne, I haven't spent a lot of time in New York state, but I've enjoyed the places I've visited there. Harry Perry is the name of the roller-skating guitarist you mentioned at the 1:06 mark in the first video. He's been there before the beginning of time and is truly a Venice Beach institution. It's difficult to explain why, with all the years of practice he's had, Harry Perry has never gotten any better on that guitar he plays while roller skating. SONG: I'm voting for JENNY & THE MEXICATS. I really enjoyed that one immediately. Very, very nice -- everything about it. My kind of music. To me it sounded like a kind of mash-up of Bossa-Nova and Olympic Boulevard Cantina music. Really cool! I'll have to check out some more of their stuffs. As for Postino's song, 'I Love It'... I hate it, I hate it, I hate it, I hate it, I hate it... You get the idea, right? And, no, speaking just for me, playing it "a few times" would only make matters worse. VIDEO: I guess I'll vote for JENNY & THE MEXICATS in this category as well. It was pretty much just a standard music video filmed on location, but I liked the sunset shots and especially the VW Bus. That VW Bus reminded me of the one my friend Dean had and the night (circa 1982) that we spent driving throughout Hollywood, throwing firecrackers at the pimps on the streets. One of them even got in his old Cadillac and tried to catch us. We wuz playing Starsky & Hutch and laughing like mad! (We finally lost him when we made a sudden U-turn on crowded Hollyweird Blvd. HA! GOOD TIMES!! Thanks for activating my memory, Lee. STMcC, I'd figured that if anyone knew the Venice Beach guitar player (I'd forgotten that he was on skates), you would know. I can't recall ever actually hearing him play. There is an underlying subtlety in the playing on "I Love It" that has tended to grow on me the more I listen. To me, the video is so funny when I watch the interactions and bits throughout--I think it is pretty clever. Birgit, the Mexicats have some very good videos on YouTube--I became rather fixated on them after I first discovered this group. A duel vote for Mexicats. Birgit, Niagara Falls is a must see. I've been there several times and I'd like to go back again. I can just stare at those falls for long periods of time and the town is kind of fun as well. I've seen signs to the wineries but have never had the time to visit any. Maybe on some future trip. "I Love It".... I LOVE IT! I liked both, but thought the music of the second one was more interesting. And the girl (who's what, 13, 14?) in the reindeer suit was just too great. John, thank you for saving this Battle from being a complete shut out. I think one has to listen closely to the music in "I Love It" to catch the solos and musical nuances. A bit of a sense of humor is also needed. The girl does a great job in the lead. Her father used to be on The Wonder Years on occasion and still works in the business. I think the girl could have a nice acting career ahead of her. So fair she has just a few credits to her resume. I vote for Jenny and the Mexicats. They're so upbeat and peppy. Thanks for the tour. I have taken visitors to St. Augustine, and of course, we must have lunch at the neighborhood diner. Janie, I've never stopped in St Augustine to sightsee, but one day I'd like to do that. I love playing tourist and taking people around. I esp. enjoyed it when I lived in San Francisco. JoJo, judging from the places you go on your blog posts, I think you'd be an excellent tour guide. I'd rather get the New England tour. Lee, I enjoyed Jenny and M-cats a lot. the video was fun, as was the music. I - like others - enjoyed just seeing the VW bus. I've owned FIVE of them, four of the old style one of the newer generation. Three Westfalia campers of the 72-74 variety and one plain ol' bus of 71 vintage. I loved them even though they were slow. I got to where it was a forced "take your time" sort of mental stance. The little kid in the second video was too cute by half, and the "music" was poo-poo. Not that there is anything wrong with that. She'll have a fine future career as a Disney star before drifting into drugs and singing suggestive songs while wearing skanky costumes. But perhaps I'm too much of a curmudgeon. Sixgun, That VW van seems to be a hit with voters. I also like Jenny, but the whole band are talented musicians all. The deer girl, Darla Jacobs, might be on a sensible track to a show biz career. Her father was a child actor and continues in the business mostly behind the scenes. Darla has so far only been credited in a few performance roles, but I think she has a future that will hopefully fare better than your prediction. Very interesting. Yep; totally different. I did not "love" I LOVE IT. A bit too out there for me - unless I was watching a kids program on NiK or Disney. The repetition was a little annoying. My vote goes to Jenny and the Mexicats. They looked like they were having fun, the music was upbeat, the video settings were intriguing. Dolorah, if you didn't find a few laughs in the "I Love It" video you were either not watching closely or you're a bit cynical about kid-centric entertainment. The repetition to me was like life--basically the same day in and day out like it is for most of us. Here in Northern Colorado we take guests for a drive up the Cache La Poudre River to watch the rafts full of adventurous folks come down the rapids...or drive up to Rocky Mountain National Park. There's still a lot to see around this area that we haven't explored even though we've lived here 19 years now. Patricia, I've never been into Rocky Mtn Nat Park, but I've been very close. Never had the time to do the park visit. There is so much to see where I am and in 26 years I've barely scratched the surface. This one wasn't hard for me. I really enjoyed the Mexicats. I'm not quite to Postino-bility yet. Mexicats big here. I'm definitely giving my vote to Jenny & the Mexicats (love the name too!). I really enjoyed their song and I was captivated by the video. The "I Love It" song: not so captivating. The video was funny... and the bridge scene seemed like a reenactment of the Melania Trump slap! Very funny. But definitely too monotonous. Wasn't moved by the costumes either. Michele, "I Love It" hasn't been getting much love in this contest. I grew up in the southern part of our state San Diego, Alhambra, Pasadena, El Monte (when it wasn't El Monte if you know what I mean). When I was a kid, the La Brea Tar Pits fascinated and horrified me. All that bubbling up of bones. How are you doing down there with those horrible fires? The reports have been awful to see and read about. I'm going with Mexicats, too. Hands down the best. C.Lee, one day last week it was kind of smoky, but for the most part the fires have not directly affected us where we live. I've been out to LA a few times in my work with Pop Star, and it's certainly an interesting place to visit. She took me to all of the most common attractions, and it's definitely a trip. Something worth seeing. Hollywood especially. Like you, however, at the end of the day... I just prefer to stay at home. 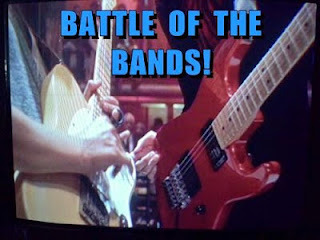 The battle: I would have voted for Jenny and the Mexicats just based on the name alone. Brilliant name. Listening only confirmed what I thought - give them my vote! Great sound and such fun energy. Meanwhile, I don't know if the lyrics ever changed in 'I Love It', or if she truly just spits that phrase out every 5 seconds for 3 minutes on end, but I made it to the 1 minute mark, X'd out, and then listened to Jenny and the Mexicats again. ABFTS, if you watch the Postino video closely all the way through there are some pretty funny gags. And the more I listened, the more drawn in by the music I became. But I kind of like getting tranced out. haha I don't have to worry about that here, nothing to see but maybe water, whoopi, for hours. Mexicats get the win. That second one just got hard on the head after thirty seconds. Hey, this was a fun battle. You'll laugh when I tell you that I did like Postino, but I turned it down after the first half just to see the rest of the scenery without hearing "I Love It!" That may be a spoiler to my choice: Mexicats, song and video (with an honorary mention to Postino for visuals only). Cherdo, well I won't laugh that you liked Postino because I liked it a lot.